What are the benefits of Australian PR? Australia is a key attraction among the immigrants to get permanent residency status and settle on permanent basis. It’s not just the job opportunities and high wages that lure immigrants here, Australia’s cultural diversity, world class cities, vibrant lifestyle and recreation activities, etc. also force the individuals and families to come down here and settle permanently. In this particular post, we will try to find out the key aspects or benefits that encourage people to get PR in Australia. What are the Key Benefits of Australian PR? 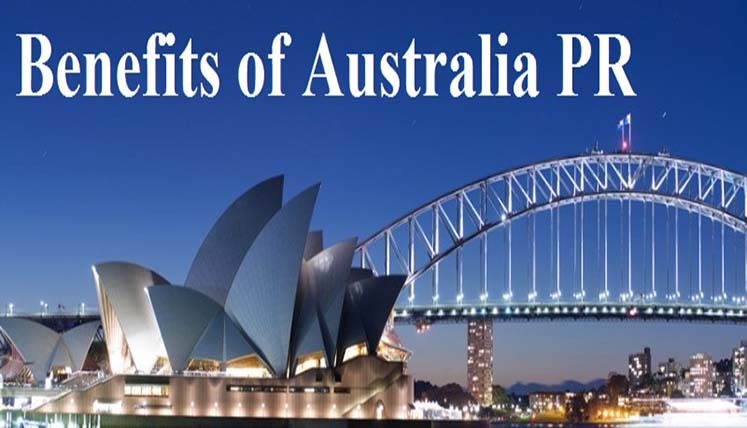 The permanent residency in the country like Australia offers plenty of benefits and privileges. Below is the list of a few of them. Permanent Residency Status: Well this, itself is a privilege or right that you are being offered the permanent residency status in the country like Australia. You can live, study or work anywhere in Australia as a permanent resident. You are allowed to travel internationally as well with certain conditions. Sponsor Eligible Relatives: As an Australian permanent resident, you get a privilege to sponsor your eligible relatives or family members to come to Australia and get the PR status here. Social Security Benefits: You are also eligible to receive various social security benefits, i.e. unemployment and student benefits, etc. However, there is a waiting period of 2 years for receiving the same. Health Coverage: As a permanent resident, you also become eligible for Medicare- a government healthcare coverage scheme that provides the free or subsidized healthcare services to the Australians. Freedom to choose occupation anywhere: You have a freedom to choose any occupation anywhere in Australia to get employed, apart from some government departments or institutions, which needs high level of security and thus are meant for citizens only. Freedom to Study: You have a freedom to choose any course of study, anywhere in Australia. There are a few student loans, which are given to Australian permanent residents only, so you become entitle for all such benefits after getting Australian PR. Eligible to Apply for citizenship in Australia: This is another key advantage you have as a permanent resident of Australia. You can apply to become a citizen of Australia and get the same after meeting the prerequisites. Citizenship to Australian Born Children: The children of an Australian permanent resident, who are born in Australia, automatically get the Australian citizenship. Freedom to Travel to New Zealand: Australian permanent residents have got the right to travel to New Zealand and apply for the NZ visa. This is the facility provided by the NZ government to the Australian permanent residents. What is the Cost to Get Australian PR? What it is the Process to get PR in Australia? The Australia allows the overseas migrants to Australia through a dedicated point based system of immigration. You need to score minimum 60 points on this system based on your age, education, language proficiency, work experience, skills, etc. factors. Higher score is better to get ITA for PR Visa. To know the complete process and to apply for Australian PR under the expert guideline, you may coordinate with the registered immigration expert for Australia at Visas Avenue. All you require is filling the free assessment form, so that expert can contact you after the assessment of your profile. For further help and assistance regarding PR in Australia, you may also call the experts at contact nos. 011-48447777 (Delhi) or 080-46668222 (Bangalore). How to Apply for a Partner Visa to Australia from India? What are the benefits of Canadian PR?